The progress of the renovations is starting to go full steam ahead. 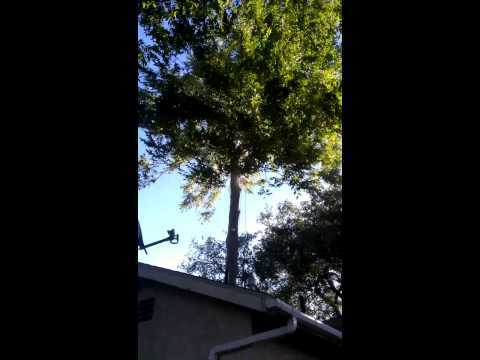 Today the tree trimmers, Oasis Tree Services, started to cut down the 40’+ walnut tree. This tree seems to just create a lot of dirt and unnecessary grime over our property and the neighbors side. The tree trimmers came out bright and early and started their work. They started by climbing the tree and removed branch by branch until they finally were able to start cutting the walnut tree down. This tree was not only more of a nuissance from the size, but it was also getting into the existing sewer lateral. I am positive by the way that the plumbers had to cut out some of the roots to run the new trenchless pipe that the roots were probably under the house. I am a tree lover but sometimes these grow in the worst possible places. They ended up cutting the tree down to the fence line. Any lower and the cost just multiplied too much to make it worth cutting down to the ground. Next up was trimming the other tree. We have to keep the other tree as it is beautiful and must remain. This tree was starting to grow into our fireplace and the neighbors fireplace, which would be a huge fire hazard. So the trimming has continued to allow the tree to continue to grow properly while shaping it up to look much better. They weren’t able to finish today, but so far the tree that will remain unnamed looks amazing and really brings some nice scenery to the front of the house. This isn’t some new construction with a brand spanking new dinky tree, this is a 1939 house with character and I love it. As the tree trimmers were doing their thing the plumbers came to finish up their job. Rooter Master came out to finish up the trenchless repipe. But they also came out with the big guns and started on the liner that will start from the property line and makes its way under the street into the sewer main. As they did this they also started to jackhammer the existing concrete out under the backyard patio deck to make way for a new plastic pipe that will connect into the house. The trench ended up being much deeper than I expected. As this was going on the painters arrived. They lined both bedrooms with paper to protect the original oak floors and started their work. The house has the original plaster walls throughout with an ugly textured paint applied from floor to entire ceilings. So they scraped off areas with bad patch jobs, lightly sanded down the texture and are starting to skim coat the areas to make a nice and smooth finish. The master bedroom is already looking amazing without paint. Next up the electrician will be pulling permits to start the rewire of the existing knob and tube wiring. The complete rewire and new recessed lights will be going hand in hand with the painting job. With everything happening at once, it feels like we are in the middle of one those HGTV shows. We wouldn’t have it any other way.